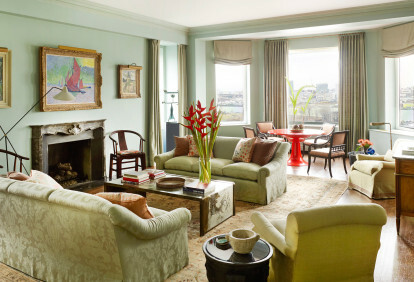 The French Quarter apartment of Robert Clepper, a New York artist and collector, is located in a Creole townhouse and measures only 350 square feet on two floors. 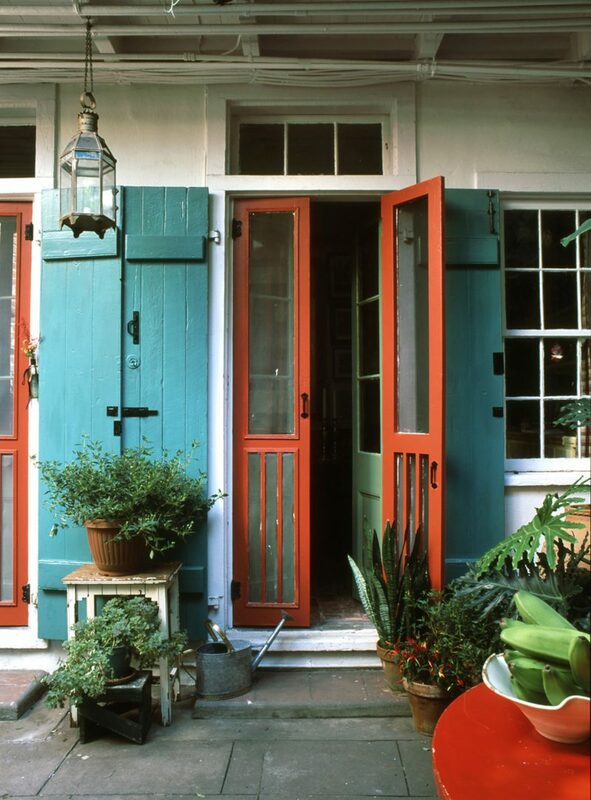 The garçonnière is full of charm, with French doors that open onto a gallery and courtyard and a twisting staircase that gives a sense of space. 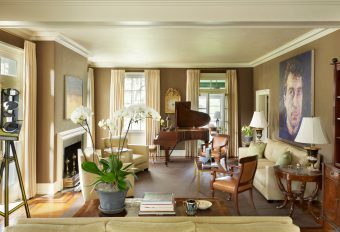 Our challenge as Robert’s friend and decorator was to exercise restraint and economy, to reinforce the historic character of the space, and, more important, to pack in as many works of his art and collections as possible. In the local vernacular, garçonnières were built as extensions behind the main house that traditionally housed the elder sons and in-laws and were modest in size. 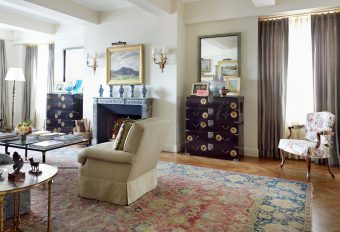 Although the progression of rooms in this apartment is brief, it includes the same components and careful consideration given to the grandest houses. 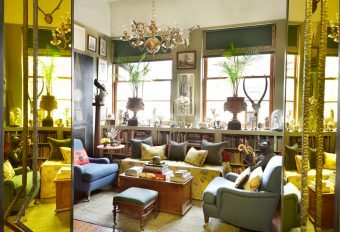 The ground floor, just beyond the entrance off the courtyard (see top image), comprises a single reception room with an iron daybed and an old Louisiana worktable that serves for cocktails, dining and the creation of Robert’s collages. A rare survivor in a garçonnière, the original curved staircase now displays balls of string collected as sculpture. 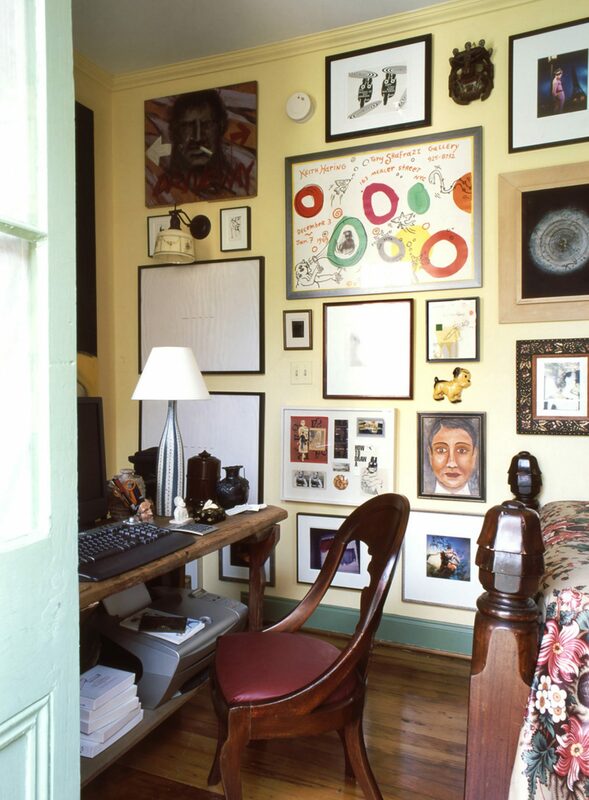 The walls are crowded with small works of art by Damien Hirst, Sally Mann, Cindy Sherman, and Robert Warner. 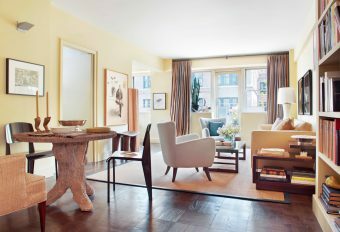 Limited space did not compromise the quality and interest of the objects to be found in the apartment. 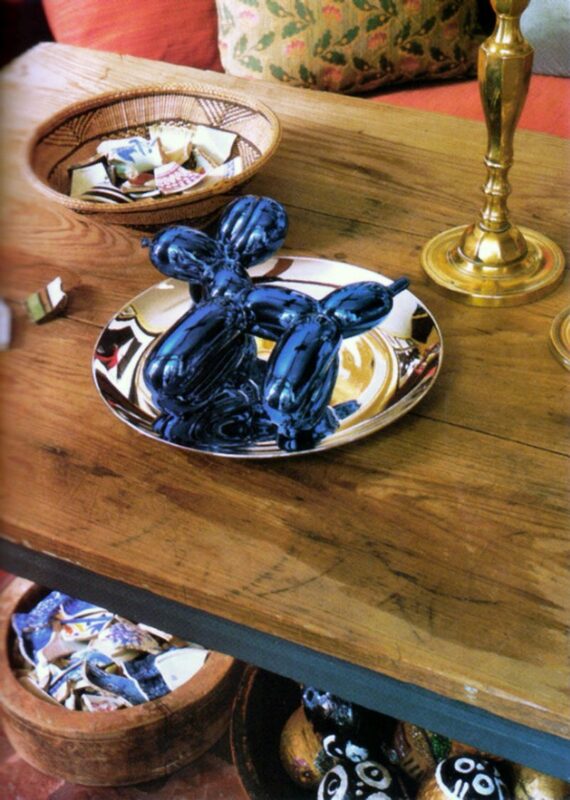 All walls and surfaces are packed with discoveries such as Jeff Koons’ Balloon Dog. 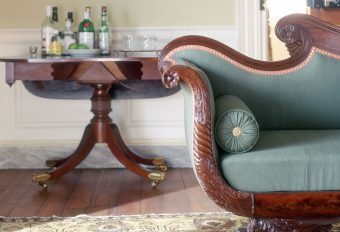 Upstairs, an American Empire bed fills out the room with a hanging at one end forming a screen for a bath and dressing area. 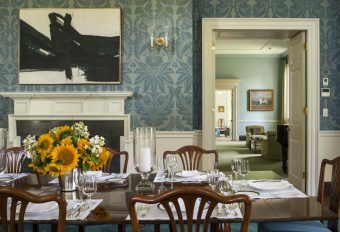 The hanging is made of Oriole glazed chintz, a document prints from Brunschwig & Fils, which also formed the basis of the color scheme. 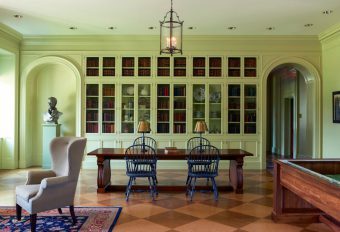 First introduced about 1830—the same decade the house was built—it is reproduced from a document at the Winterthur Museum in Delaware. 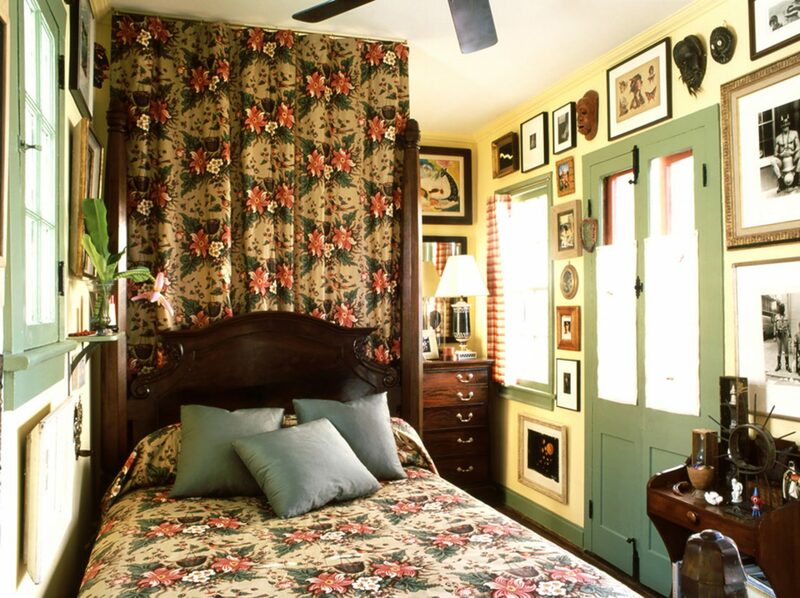 The original is an English roller- and block-printed chintz on what was called a “tea ground.” The orange plaid curtains repeat the color of the screened-door frames. This variety of textures provided rich visual complexity—especially in such close proximity. 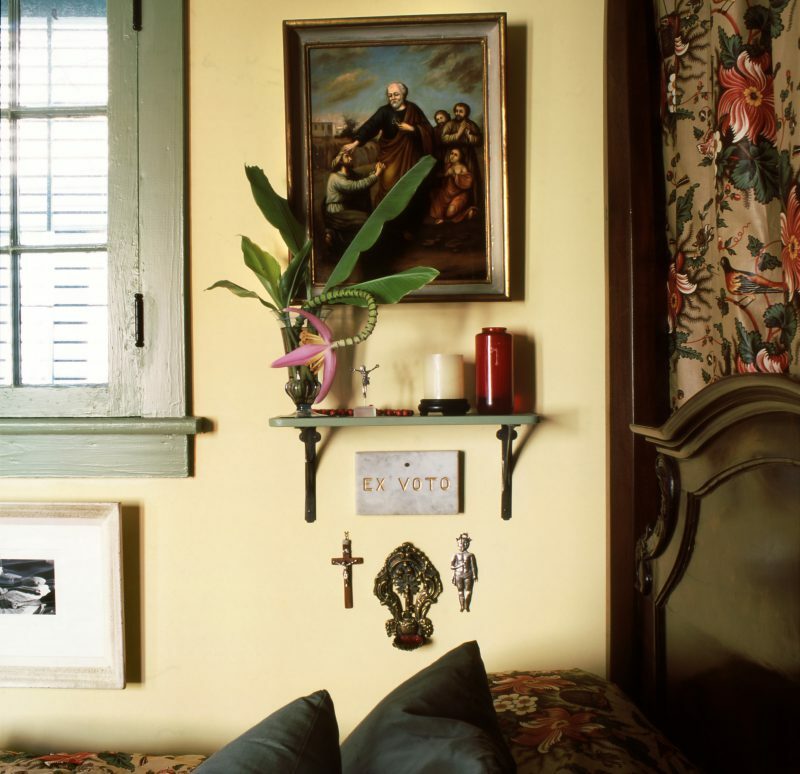 A small shrine with ex-votos and candles form a spiritual composition on the wall besides the bed. 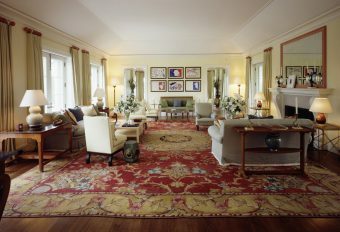 The real challenge was installing Robert’s collections—imagine a puzzle on the grandest scale. Works by famous artists happily coexist with local ephemera, including prints and drawings related to the French Quarter and Mardi Gras. 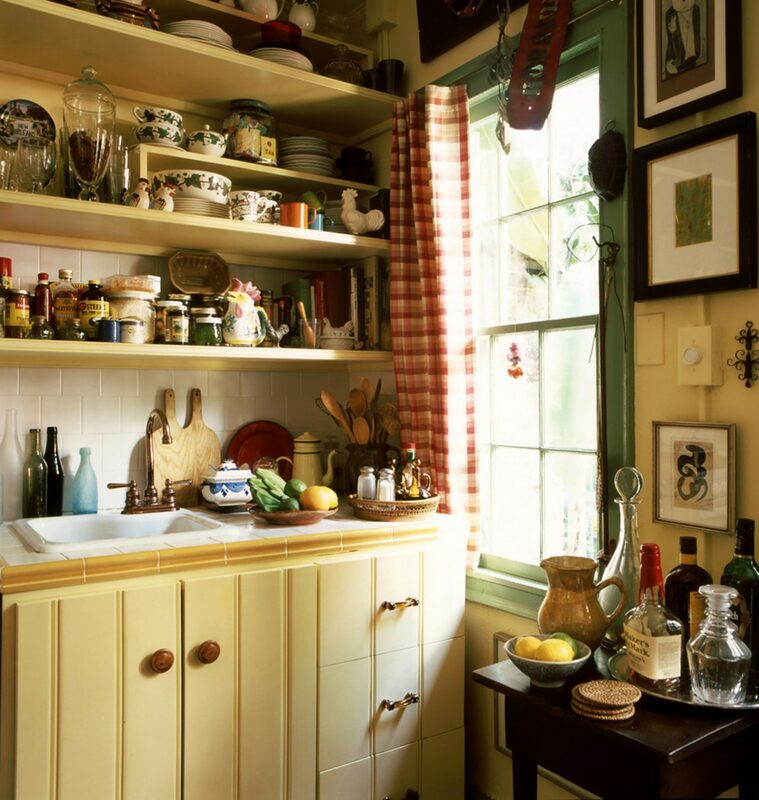 The color scheme used throughout and highlighted in the modest kitchen area are ones associated with Creole architectural traditions in Louisiana. 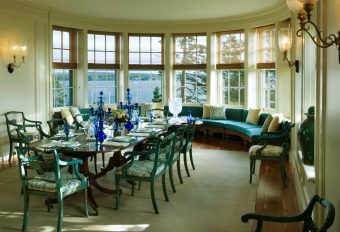 Because of the small scale of the space, those colors –pale yellow walls and green trims – are repeated throughout. 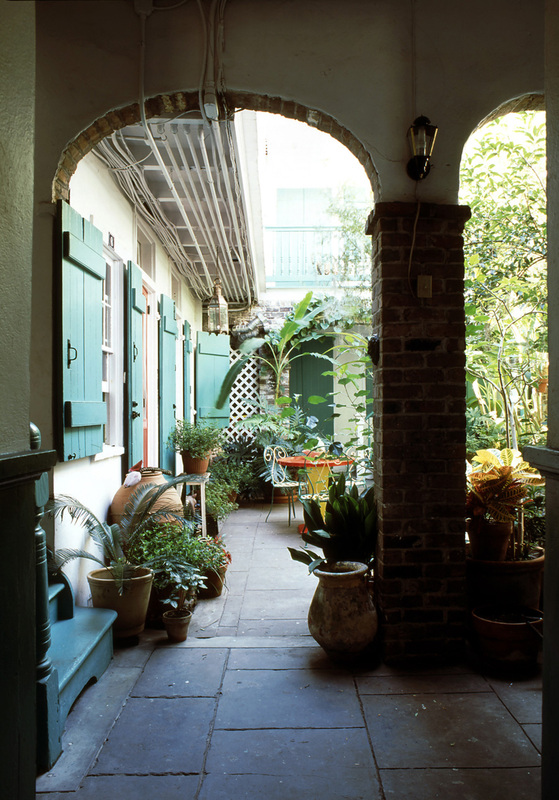 The courtyard adjoining the apartment originally functioned as utilitarian space in the 19th century, used as a general workplace for manual labor or kitchen work. 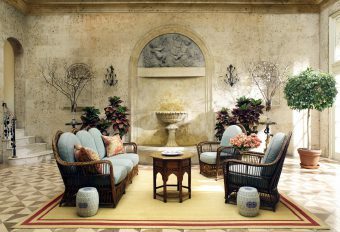 Today it functions as an outdoor room, enhanced by old terra-cotta storage jars, iron furniture, and informal subtropical plantings that follow the local traditions.